Creating Your Own Sound Scripts! If you don’t know what a sound script is, well you’re in for something rather special! Although you can play sound files directly by targeting the raw file, a sound script will allow you to control the sound in different ways. You can use a sound script in custom: maps, mods, and games. 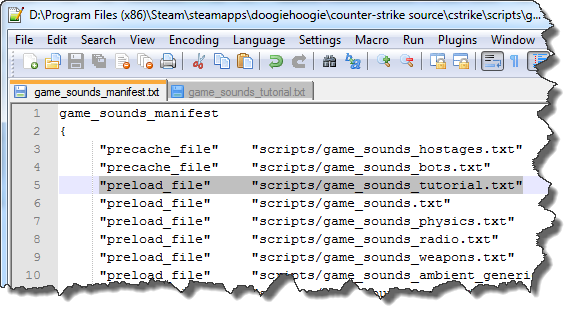 While you might not want to make a sound script if you’re just adding music to a single custom level, you will want to make them if you’re using custom sound effects, or many different sounds. Choosing a shorter, more organized name for the sound. Ability to modify the sound without creating more sound files that would otherwise waste space. Choosing a random sound file from an array. Subtitles (We won’t cover this, and custom subtitles are only for mods). Channels that handle the sound differently based on the use. DSP modification, and sound characters. None, there is no reason NOT to use them. As you can see it’s a rather simple file, all you do is copy an existing line and change the file that it points too. Now lets look at what a sound script entry looks like, I’ll be sure to break it down into it’s simplest form. “channel” “CHAN_STATIC” //Channel that the sound functions on. If it is not defined it will use the default channel. “pitch” “100” //Pitch of the sound, can be 0-255, 100 if default. If it is not defined it will use the default. “soundlevel” “SNDLVL_90db” //Sound level, this is used for sound attenuation. It is basically how fast, and how far it falls off. “wave” “level/explode_1.wav” //Sound to be played, must be a WAV. Pretty simple so far right? Good! Now lets make one from scratch! I’ll name my file game_sounds_tutorial.txt. Once you’ve made the script make sure to place it in the proper location: GameGamefolderscripts Then append the newly created script file into the manifest. Now time to create a sound entry in our new file. There are a few things that you need to keep in mind when you name your sound. First the restrictions, there can only be one “.” in the sound name. So if the sound it not working make sure you’ve only used one. When you name the entry try to keep is simple, I follow this setup: “Type.Description_Number“. So for this I’ll be naming my sound: “Explosion.LargeMetal_01“. Now we need to add some controllers and settings. Now let me warn you here, and make sure you know this: If you DON’T enclose every command and parameter in quotes. ” <– Those things! Make sure to use them! First you’ll want to choose what sound file you are going to play in this entry, there are two ways that you can play sounds in a sound script. Wave – A single wave that will be played when called. Rndwave – An array of sounds that are randomly chosen from when called. So with that when the sound is called it will randomly choose a value between 0.4 and 0.8. This allows you to reuse sounds without it looking super obvious. Generic physics impact sounds, health/suit chargers, ‘use’ sounds. Sounds that can be delayed by an async load, i.e. aren’t responses to particular events. Confirm: This won’t make the sound actually stream; use the * prefix for that. A constant/background sound that doesn’t require any reaction. Still with me? I knew you could do it! Bypasses DSP and affected by the user’s music volume setting. Non-directional; audible everywhere. “Default mono or stereo”, whatever that means. Stereo with direction: left channel for front facing, right channel for rear facing. Mixed based on listener’s direction. Note: Sometimes “(” must be used instead; see below. Voice chat data. You shouldn’t ever need to use this. Adding “)” in front of a stereo sound name in the soundscript such as “)weapons/m4a1/m4_shoot.wav” tells the sound engine that it is a spatialized sound; this allows the sound to emit from a specific location within the world. When not used, stereo sounds play in a fixed 2-channel orientation and cannot be panned to simulate a location. Single-channel files do not require “)” before the filename and will be spatialized automatically. Adding ^ in front of a sound name, such as “^weapons/explode3.wav” tells the sound engine that it is a distance based sound. The left channel of the .wav is the ‘near’ sound that will play when the sound originates close to you, and the right channel is the ‘far’ sound that will play when the sound originates far from you. If the ^ mark is not used in the soundscript the sound is treated as stereo with no directionality or distance. This is a different feature than the sndlvl entry to control attenuation. This distant variant feature allows you to play two different sounds (but using only one file) and cross-fading between the two depending on how far away the sound originates. I hope that you enjoyed this quick little tutorial on Sound Scripts. If you have any questions be sure to ask!